DM Snake with Channels 1-16 labeled shown above. 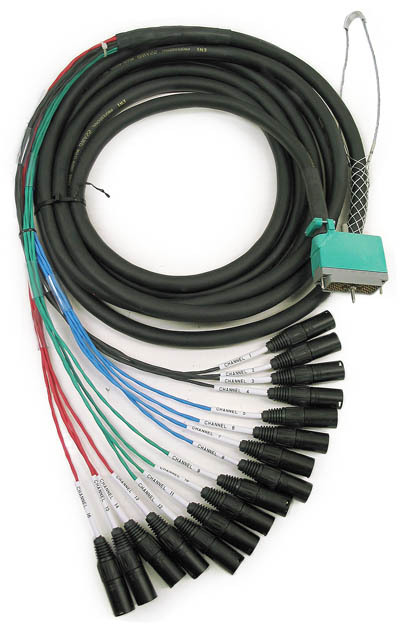 We began selling our EDAC 16 channel patch snakes as a specialty item to hook up an ADAT deck, or other similar device which is equipped with a Female EDAC 56 pin 516 connector and patch it to a mix console. 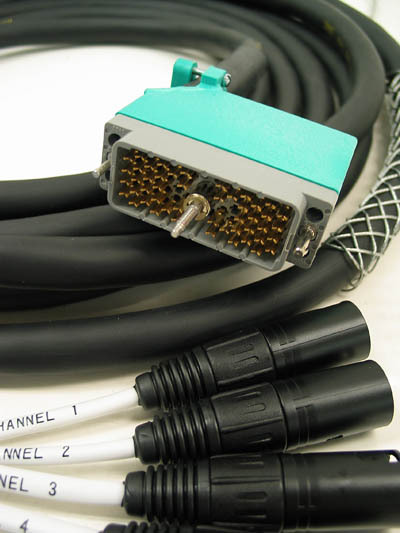 The EDAC 56 pin 516 connector provides 16 balanced channels of audio to one mass disconnect. It has turned out to be such a good, cost effective mass connection device, that we have been incorporating into some of our other items. In particular the PSPX and RPPX splitter snakes and PFQ series patchbay systems. The fantails are approximately 22" each with a functional spread of about 40". The main trunk is constructed with EWI SMC cable. This is a textured foil shield cable. The two conductors for each channel are 22ga. high purity copper and the pairs are individually textured foil shielded. The ends are heavy duty EWI MXLR. 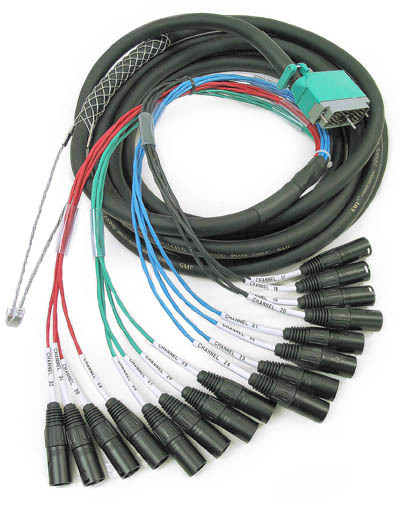 The "DM" series cables consist of the EDAC connector to 16 EWI ES3MB-GDP Male XLR cord ends. The 16 channels are color grouped into four colors with four channels per color. You can choose to have the ends labeled channels 1-16 or channels 17-32 depending on your particular need. These snakes were designed by users to be user friendly. Click here for a pin-out of the snakes. Mesh grip strain relief on one fantail. Multi-channel patching for effects or recording devices equipped with a standard wired ADAT type mass connection. Multi-channel patching for other equipment including EWI splitter snakes and patchbays. DM-16-15: 15 ft., 6.5 lbs. DM-16-20: 20 ft., 7.5 lbs. DM-16-30: 30 ft., 9.0 lbs. DM-16-40: 40 ft., 10.4 lbs.